In recent years, it’s gotten a reputation as a superfood. Leaf cabbage, also called kale, is a brassica species which really packs a punch. But growing kale isn’t something a lot of people consider doing. They should! Vitamin-packed kale (Brassica oleracea) is considered to be among the world’s healthiest foods. Rich in Vitamins A, C, and K, it’s also mineral-rich, packing a good calcium and potassium punch. For a leafy green, it’s protein-rich as well. One cup of kale will give you 2.2 grams of protein. We’re going give you the best tips for growing kale, including information about the various types and a good number of planting tips. By the time we’re done, you’ll be a kale growing expert. Common Name Kale, lacinato kale, dinosaur kale, leaf cabbage, etc. Pests Aphids, whiteflies, thrips, cabbage worms, cabbage loopers, etc. Diseases Clubroot, alternaria leaf spot, anthracnose, etc. 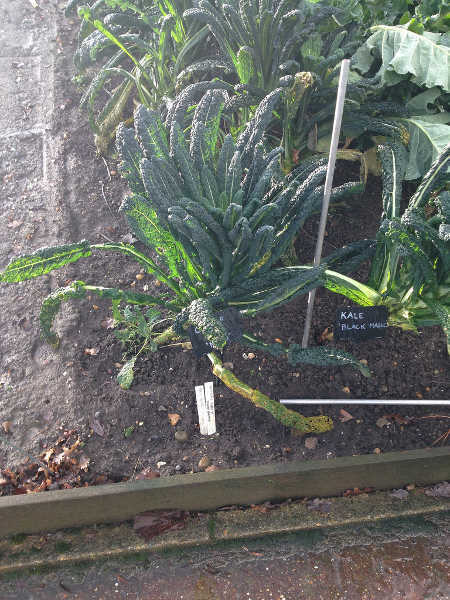 A member of the cabbage family, kale comes in different varieties. Let’s go over them now and explore the variations. 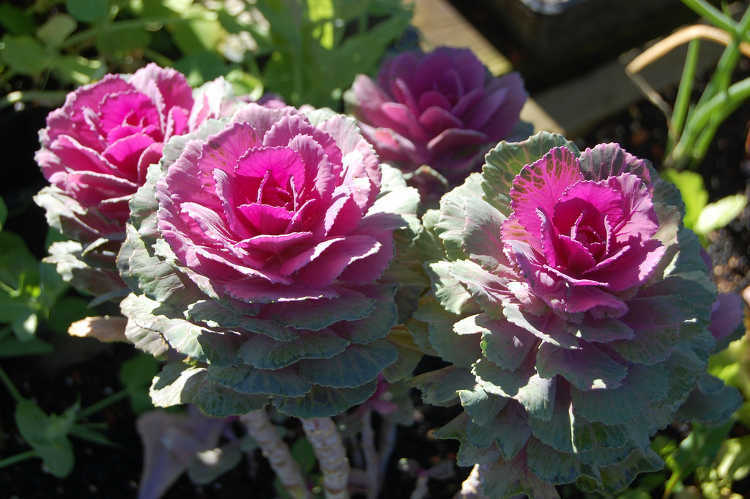 These kale types are considered ruffled or frilled leaf types. The leaves form dense, deep curled patterns which look almost like gathered lace. Often used for ornamentation or plating in cooking, these also work extremely well in salads and soups. Because of their pretty leaf shape, they’re some of the most common kales grown. 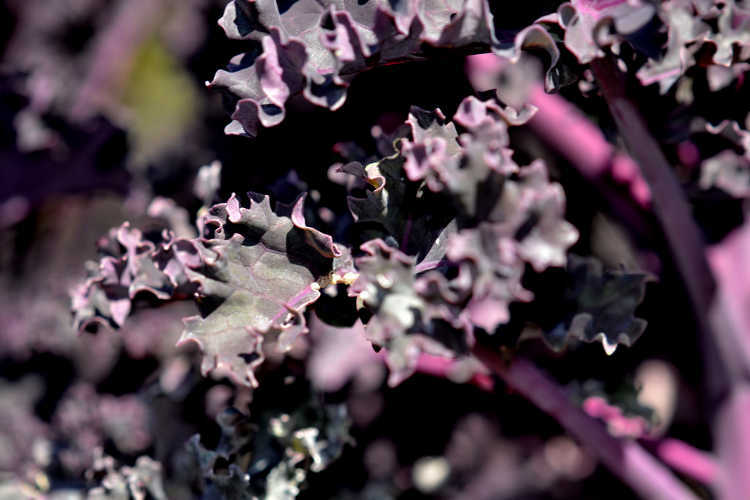 By contrast, these kale varieties tend towards flatter, easier-to-trim leaves. Some have fringe-like exteriors, giving them an interesting shape. One variety is even described as being like maple leaves. Flat leaf kales tend to be more tender than the curly varieties, and work well in salads. Lacinato kale is commonly referred to as “dinosaur kale” simply because of the size and texture of the leaves. This variety grows tall, narrow leaves which are deep green in coloration and are bumpy like how one might envision dinosaur skin to be. However, because of its savoyed and long leaf shape, it’s extremely easy to trim out stalks. The long leaf shape makes it easy to slice up for salads and use in soups and stews. Don’t let the name fool you! Ornamental kales are just as edible as the other kale varieties. 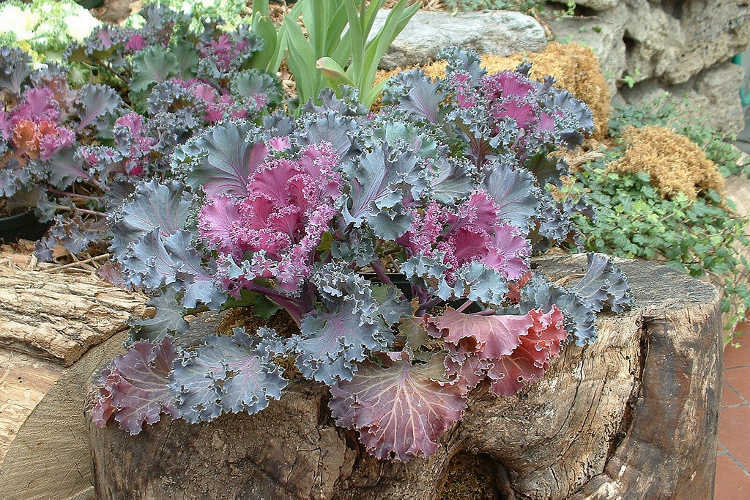 Also referred to as “flowering kale”, ornamental kales are vibrant little patches of color in the garden. 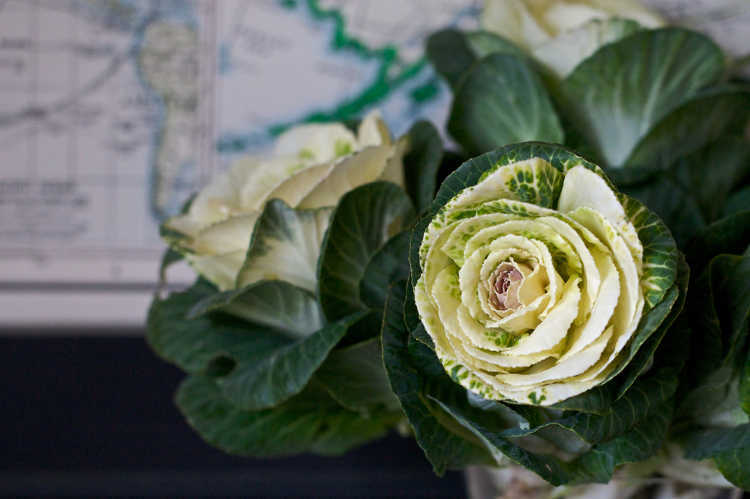 Most ornamental varieties have a shorter leaf and a more cabbage-like round head, revealing their close relation to the cabbage. The center of these kale heads tends to provide a bright pop of color in the winter garden. Planting kale itself is extremely easy. Just follow the steps below! Depending on where you’re located, early spring through summer is best for planting kale. If you’re in an area where it doesn’t regularly get below 15 degrees Fahrenheit, you can grow most types throughout the winter as well. For these areas, plant your winter kale in the fall so it has time to become established before the chilly weather comes on. If you’d like to get a jump on spring planting, you can start your seeds indoors in the latter part of the winter. Use a seedling heat mat to keep the soil warm. Once the seeds emerge, use a grow light to provide them with ample “sun” until you can harden them off outdoors. In most cool climates, kale should be planted in full sun conditions. For locations where there’s extremely hot summers, you can plant in partial shade to prevent the leaves from bittering. Kale grows extremely well in raised bed situations, but will also grow just as happily in a standard garden bed. You can also grow kale in a container. You’ll want pots that are gallon-sized or larger for each plant. I actually prefer larger ones so the roots have plenty of room. As this plant can last for more than one year, you may want to take into consideration how large you want it to get. Older kale can get tall, and you may need to take that into consideration when planning. 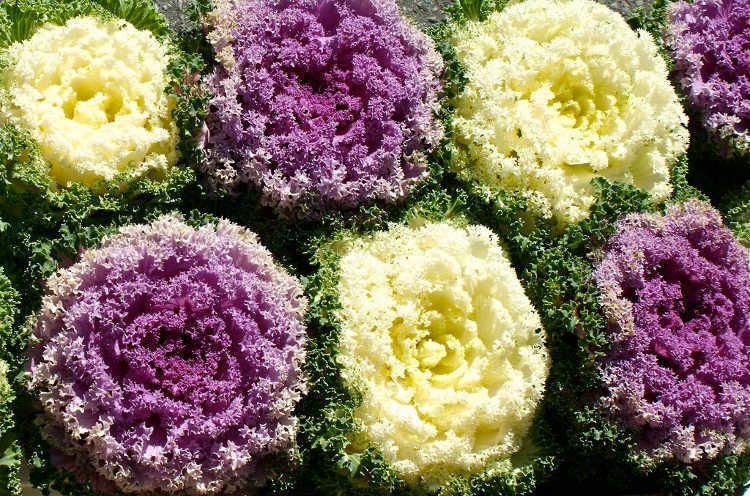 Naturally, kale is biennial, meaning that it can take up to two years to complete its flowering cycle and then die off. Most people grow crops of kale as an annual. It’s a gorgeous ornamental, even if you don’t want to eat it! Some varieties like Redbor produce stunning, ruffled purple or reddish leaves that can create a bright counterpoint for other plants. Begin by loosening the soil and adding any fertilizer you wish to add. Once your soil is prepared, plant seeds 1/4″ to 1/2″ deep. Once they’ve come up, wait 2 weeks and then thin out the seedlings. 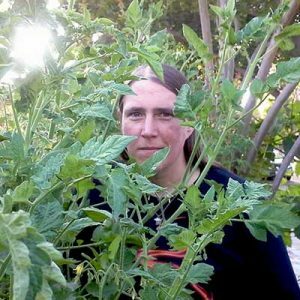 Ideally your plants should be about 10″ apart, but anywhere from 8″ to 12″ is fine. For transplanting young kale plants see the section below, as planting seedlings is slightly different. For the most part, a kale plant will take care of itself, provided it’s got what it needs. When growing kale, make sure you have the best conditions you can provide. Keep reading to learn what conditions are optimal. In most moderate climates, full sun conditions are just fine for your kale. The more light you can provide, the better. Same with cooler climates. However, if you live in the desert, aim for partial sun conditions. Kale will benefit from some afternoon shade during the worst heat of the day. Kale requires at least 6 hours of sun per day even in partial shade for best growth. Kale seeds will germinate at as low as 40 F, but they sprout more quickly at soil temperatures in the 60’s. The plant itself loves temperatures between 65 and 75 degrees, and will thrive at that range. However, it can tolerate weather extremes very well. In the heat, leaves will become more bitter. In light frost conditions, the leaves become sweeter and can pick up an almost nutty flavor. Full freeze conditions require some form of protection, such as a cold frame. Established plants will tolerate extreme heat, but will require extra water and can benefit from mulching to slow its evaporation. 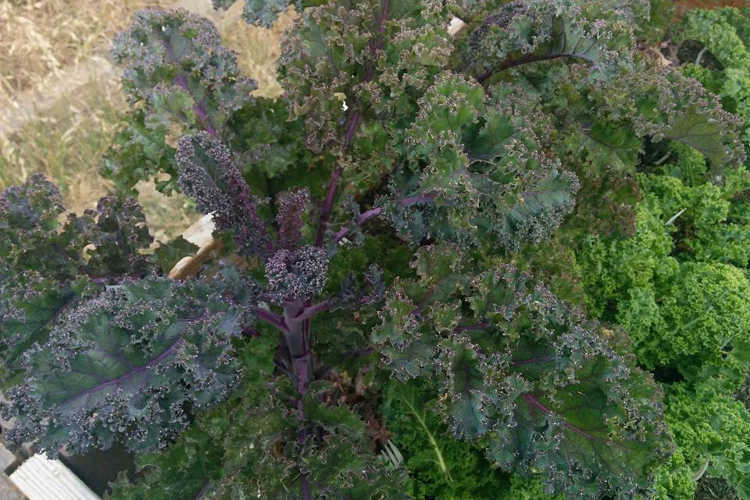 As kale can be grown as a biennial, it will grow year-round. Trying to provide the best temperature range possible each season will make for happier, healthier plants. Speaking of water, kale likes even, consistent moisture. An inch to an inch and a half of water per week is sufficient to keep your kale pleasantly happy. However, you are going to need to ensure that your soil drains well. Kale typically doesn’t like to have wet feet. If your soil’s too soggy, it promotes fungal diseases like root rots, which will kill off an otherwise-healthy plant. Well-drained soil is best for kale, as I just said. However, it’s a heavy feeder. Be sure to mix in plenty of compost prior to planting, along with a slow-release fertilizer. This provides ample nutrition for your plants. If you have sandier soil, consider working in some organic material. Peat moss can provide moisture-retention while still allowing the excess water to drain easily. Most composts work similarly as well. Clay soils need to be repaired to prevent water buildup on the soil surface. While kale can grow in a clay soil, it’s more susceptible to problems, and may not get as large as it might in other soil types. Kale prefers a pH range of 5.5-6.5. You can use a neutral soil for kale, but it tends to be a bit happier if the soil is lightly acidic. Pine needle mulches work extremely well for kale as a result. If you’ve prepared your soil properly, a single feeding of a slow-release fertilizer once you’ve harvested the leaves once is all that’s required for annual kale. Aim for a balanced fertilizer like a 10-10-10 range. If that’s not available, opt for higher nitrogen to promote leaf growth. Granulated fertilizers should be broadcast over the soil’s surface, but avoid touching the side of the plant to prevent fertilizer burn. Liquid fertilizers are usually diluted and are safe on the plant itself. 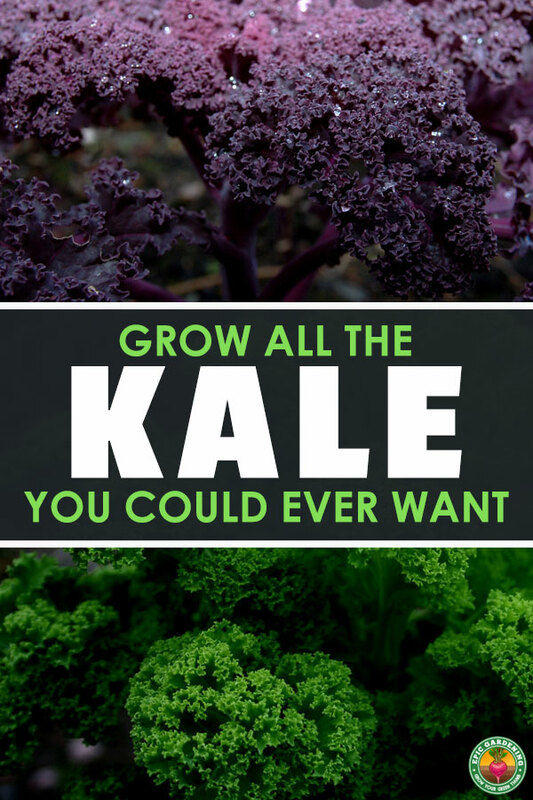 Kale is especially fond of compost tea and fish emulsions, so these are great choices. A high-quality compost used as a top dressing will generally provide all of the nutrition needs for your plant as well. 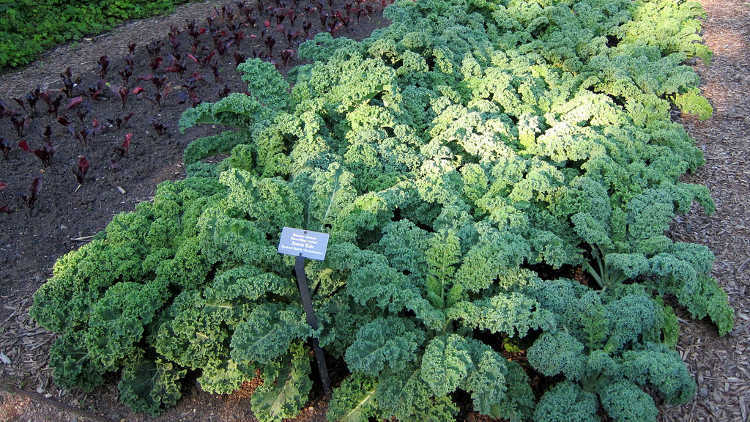 For those growing kale as a biennial, you will want to fertilize once per season to ensure it has sufficient nutrition. It will continue to produce leaves as long as it’s fed right! For pruning tips, see the “harvesting kale” section below. You shouldn’t have to prune it except during harvest time. I do recommend removing bug-eaten leaves or those which are browning or withering, as they might be diseased. Dispose of those appropriately. As the plant ages, the lower leaves become inedible first. They will yellow and drop off on their own. Remove them to the compost pile so they don’t encourage pests to take up residence. If you’re growing ornamental kales, you can also remove outer leaves to try to brighten up the bunch. Simply snip them off close to the stem as necessary. Kale is most often propagated by seed, as mentioned above. You can also start growing kale from cuttings. For cuttings, find an extremely healthy side stem with multiple leaves, and cut it at the main stem of the plant. Trim off lower side leaves, leaving only the top leaf. Once your side leaves are removed, examine what’s left. If it’s a large leaf, cut off the top half of the leaf, leaving only the bottom half attached to the stem. This reduces the size of the leaf that the stressed plant will need to care for. Cut the base of the stem at a 45-degree angle just below one of the leaf nodes, and place into a pot of prepared, well-draining and damp potting soil. Mist the soil regularly to keep it moist, but not wet. It should develop roots within 3 weeks. If you want to, you can dip the stem into rooting hormone before planting it, but this is purely an optional step. Some reports indicate that rooting is quicker and the plant healthier as a result. You should be able to transplant your rooted cutting into the garden in about three months after hardening it off to the outside weather. Planting a young kale plant is quite easy. Prepare your soil, then dig a hole that is large enough to fit all of the soil with the plant to be transplanted. Carefully remove your kale seedling from its pot. Examine the bottom to make sure the roots are not wrapping around the soil. If they are, gently massage the root and soil mass to loosen it up. Set your plant into the hole and cover it to just barely above where it had been planted before. Water it in well. Did you know that kale can be grown extremely well as a microgreen? As the stem is edible along with its leaves, it makes for a tasty treat! You can read my full piece on how to grow kale microgreens for a wealth of information on this topic. In that piece, I’ll take you through the entire process. Everything from seeding the tray, caring for the sprouts, and harvesting them is covered. Kale has friends, and it likes to spend its time around them! Of those good neighbors, catmint will repel flea beetles. Radishes will lure flea beetles away from the kale, as will nasturtiums (and nasturtiums will lure aphids away too). 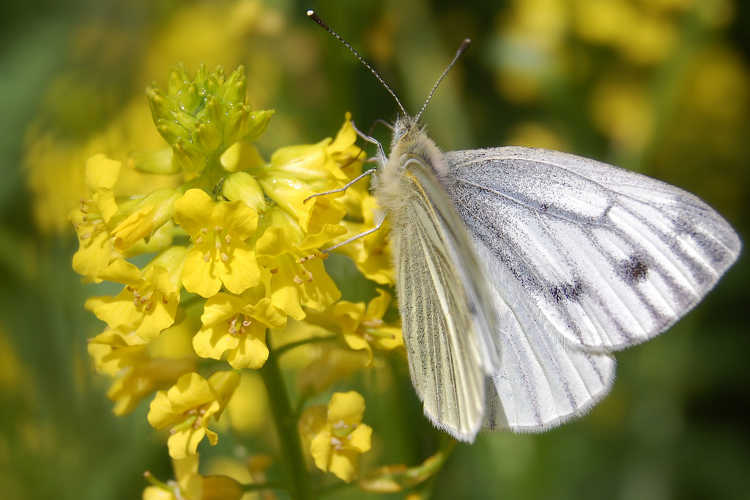 Mustard and bittercress will act as lures for caterpillars. Basil should be grown near but not right next to kale. They know each other, but tend to fight for root space. Basil will also repel flea beetles from your kale, so it is useful to have nearby if not in the exact same bed. However, kale has a few enemies as well. Avoid grapes, tomatoes, or rue near your kale plants, as they have a negative impact on the growth of your kale. Strawberries and kale also have a bit of enmity, so keep them separate as well. While this process may seem a bit tricky, I’ll show you how to do it quick and easy! 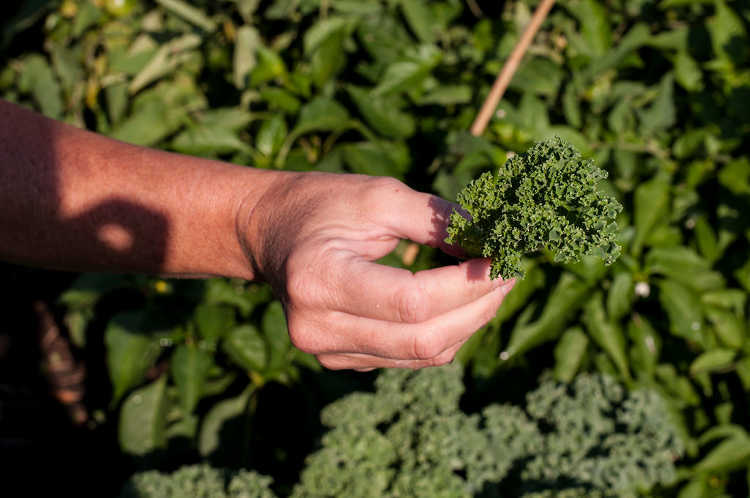 The trick to know about harvesting kale is when it’s best to harvest. In the heat of the summer, larger leaves can become more bitter, so it’s important to pick them when they’re still young and new rather than allow them to grow to monstrous sizes. This is also a great season for harvesting microgreens. Early summer and fall harvested kale tends to be less bitter. Winter-grown kale is surprisingly sweet, as long as it doesn’t endure frost conditions that can harm the leaves. If you are trying to harvest young leaves, you can begin removing the lowest leaves on the plant once it’s 4″ in height. Harvest full-grown leaves once the plant is 10″-12″ in height. Allow the top clusters of leaves to remain intact for future growth. Usually, a typical harvest is just a handful of leaves. In the peak heat of the summer, do a hard cutback of your kale to encourage new growth. This helps eliminate those bitter leaves. 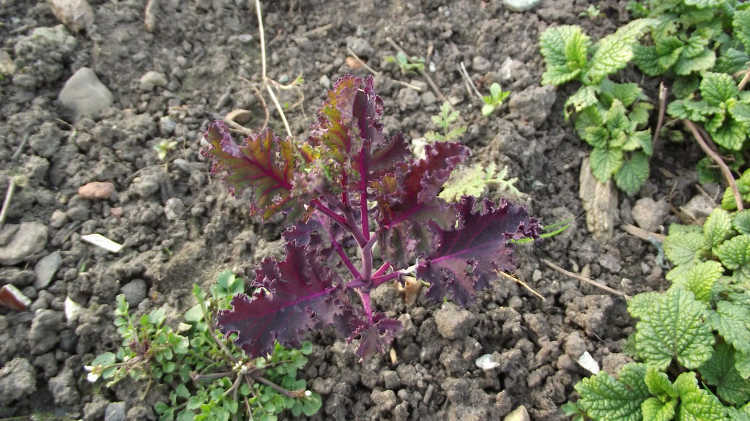 Remove all but the top four or five leaves from the kale plant, leaving a tall stalk. Then, simply allow the leaves to grow back on their own. You should have new leaf growth within two weeks, giving you a late summer harvest. Kale can be stored in the refrigerator for up to a week without any problem at all, as long as you know how to protect it. Do not wash your freshly-harvested kale unless you make sure it’s completely dry before storing. Instead, bring your kale inside and wrap the bundle in paper towels. Place it in a zip-top bag in the coldest part of your refrigerator. Be sure to remove as much air as possible from the bag before storing. 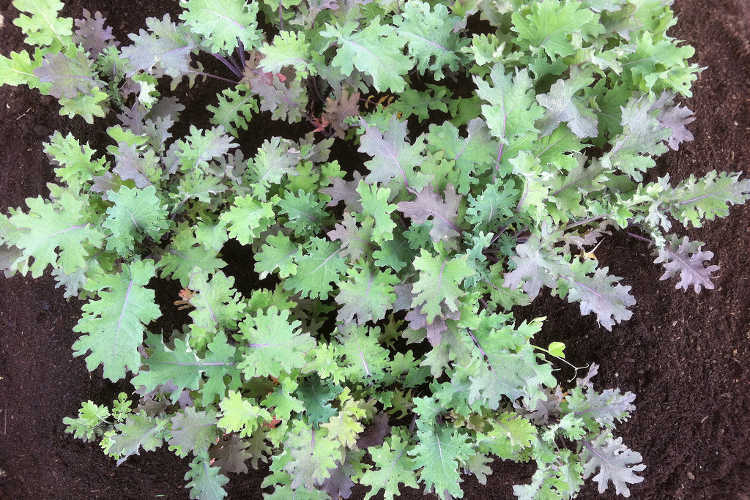 If you have a flat-leaf kale variety, it’s even easier to protect your leaves. Lay out a strip of paper towel, and place your leaves on top of it. Top with another strip of paper towel. Then, starting at one end, gently roll it up into a bundle that will fit into your zip-top bag. Remove excess air from your bag, and place in the coldest part of your refrigerator. If you’d like to prepare kale for future salad use, you can remove the stems and slice it into ribbons. Place it between paper towels in a zip-top bag with excess air removed. Don’t waste the stems, though! You can cook the stems on their own as a nutritious green vegetable. Prepare a large pot of boiling, salted water, as well as a bowl of ice water. Remove the stems from your kale and drop the leaves into the pot until they brighten in color. This should take 1-2 minutes. Then, remove the leaves. Place them in a colander and shake out any excess hot water, then submerge the leaves in ice water to stop the cooking. Once fully chilled, dry your leaves in a salad spinner or pat them thoroughly dry. Place your dried kale leaves onto a baking sheet in the freezer until the leaves are frozen solid. This should take a couple hours. Once they’re completely frozen, transfer the leaves to a freezer bag with excess air removed. These can be added to soups or stews while still frozen. They’ll thaw and cook in the soup, and they’re easy to chop down to a reasonable size while frozen. You can also add them directly to smoothie mixes. Kale can be canned. This requires a pressure canner, as it’s a low-acid food. Check the manual which comes with your pressure canner for a recipe, or look for a canning recipe book to ensure you have a safe method. It can be dehydrated too! 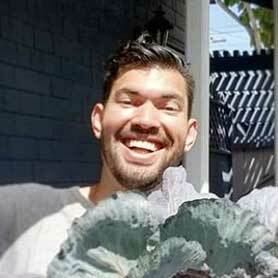 Have you seen kale chips at the market? They charge a small fortune for them, but you can make them at home. A dehydrator with heat will quick-dry kale in under 5 hours, where an unheated or low-heat dehydrator may take as long as 8 hours. If you don’t have a dehydrator, you can always use your oven to make kale chips. Once made, either store them in a sealed, airtight container with a dessicant packet or a zip-top bag with all the air removed and a dessicant packet. Kale can also be freeze-dried. While few of us have an expensive freeze-drier, those who do will find that you can freeze-dry the leaves to use later in soups, stews, or as kale chips on their own. If it’s dehydrated or freeze-dried without any added flavoring, you can powder the dried leaves and store them in a mason jar with a dessicant packet. This kale powder makes a great addition to smoothies. Kale doesn’t have many problems, but when it does, they’re typically pest or disease-related. Let’s go over some of those now and how to handle them. Aphids, especially cabbage aphids and turnip aphids, find kale delicious. They also carry a wide number of plant diseases, and can cause major plant wilting. Whiteflies and thrips can also come to play. Like aphids, these are sucking pests that will sap the life out of your plants. You don’t want any of them around while growing kale! Beating all three is easy, as regular spraying of neem oil repels them. It also kills off existing infestations. Caterpillars also feast on your kale. 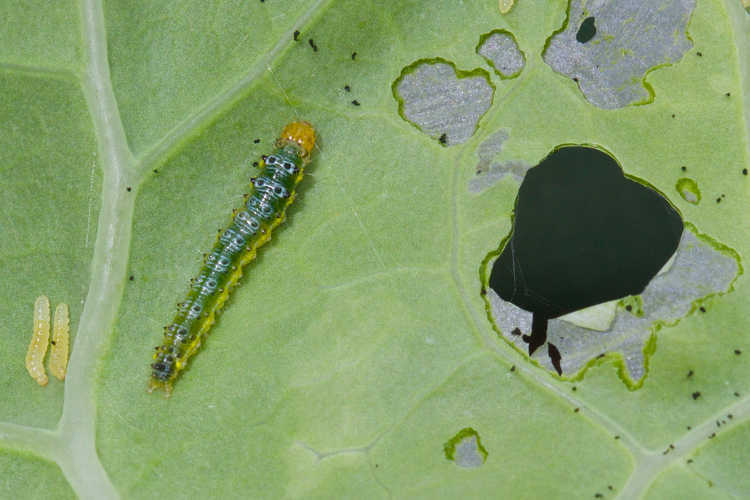 Cabbage worms, cabbage loopers, cutworms, and army worms all consume various parts of the plant. Thankfully, there’s one solution for all of these caterpillars: bacillus thurigiensis var. kurstaki. Purchase BT in a spray form as Monterey BT, or in a powder as Garden Dust. The root knot nematode can be another problem. They chew into root structures under the soil’s surface, causing major damage. With these, you’ll want to fight back by applying beneficial nematodes as plant defenders. They take out many pests including root knot nematodes, fungus gnats, root maggots, wireworms, cucumber beetles, and more. Speaking of root maggots, the cabbage root maggot is another major pest for kale. 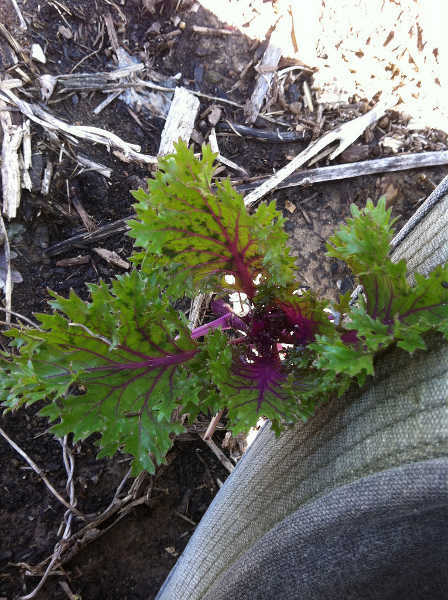 In addition, flea beetles can take up residence in and around your kale as well. While beneficial nematodes can help wipe out root maggots, they don’t work against flea beetles. In these situations, I recommend PyGanic, a naturally-derived pyrethrin spray which can demolish both pests. Finally, snails and slugs will leave slimy trails along your kale leaves and chew leaves into oblivion. I recommend using Garden Safe Snail & Slug Bait, which you simply sprinkle around the outskirts of your garden. They’ll find it on their way to eat your kale, eat the bait instead, and die. Clubroot is a common fungal disease among cole crops. It causes the roots of your kale to become clubbed and misshapen, plus prevents them from easily taking up water or nutrition. The most difficult thing about clubroot is that most common fungicides won’t fix the problem. It’s spread by tiny fungal spores that can live in your soil for up to 20 years. Your only real solution is to avoid planting susceptible crops in that location. Solarizing the soil to sterilize it may also help kill off the spores, but isn’t always successful. Alternaria leaf spot is another problem. This fungal disease causes water-soaked brown or black spots on kale leaves, sometimes with a yellowish ring around the spots. While there’s no cure for alternaria, there are prevention measures. Using a product with bacillus subtilis in it such as Serenade Garden will help build up plant resistance. Neem oil can help protect the leaves against the fungal spores. Another fungal disease which strikes kale is anthracnose. This causes greyish to straw colored spotting on leaves and can also spot stems. Untreated, it weakens the plant and can lead to other diseases such as bacterial root rot. Treatment for anthracnose involves spraying the plant thoroughly with a copper-based fungicide such as Bonide Copper Fungicide. Keeping the soil slightly more dry can help prevent further outbreaks. 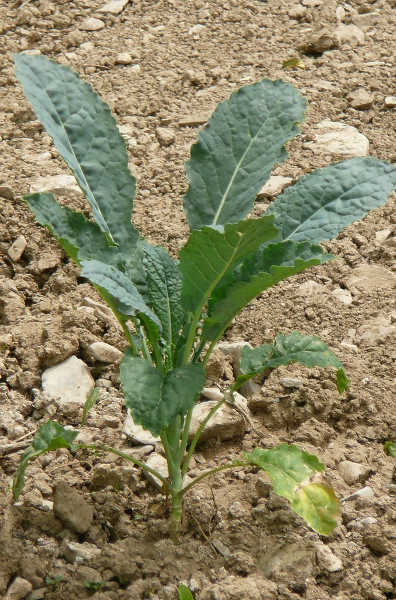 The soil fungus Rhizoctonia can cause a number of problems for kale. Young seedlings can fall victim to damping-off, where they rot right at the soil line in moist soil. Older plants can become susceptible to wirestem, which can stunt the plant’s growth. It also causes bottom rot. Avoiding rhizoctonia is usually as simple as being sure to rotate crops. Don’t plant new kale crops in the same location year after year. The fungus can live in the soil for up to three years, so practicing good crop rotation can allow it to die off. Black leg, or phoma stem canker as it’s alternately called, is a newly-emerging fungal disease in the Pacific Northwest. It causes stunted growth and girdling of the stem, and can lead to reduced yields or plant death. This disease currently has no established treatment other than to stop the spread of the fungal spores. Some chemical fungicides have proven to assist slightly with prevention. Blackleg appears in areas which are prone to humid or wet conditions, and can be spread by soil, infected tools, or on the seed itself. The only thing which has offered any hope so far is hot water seed treatment prior to planting, and prevention of the conditions for the spores to develop. Avoid planting brassicas in an area where black leg has developed for at least four years, and consider solarizing the soil to try to kill off fungal growth. Destroy infected plants before they can produce more spores. 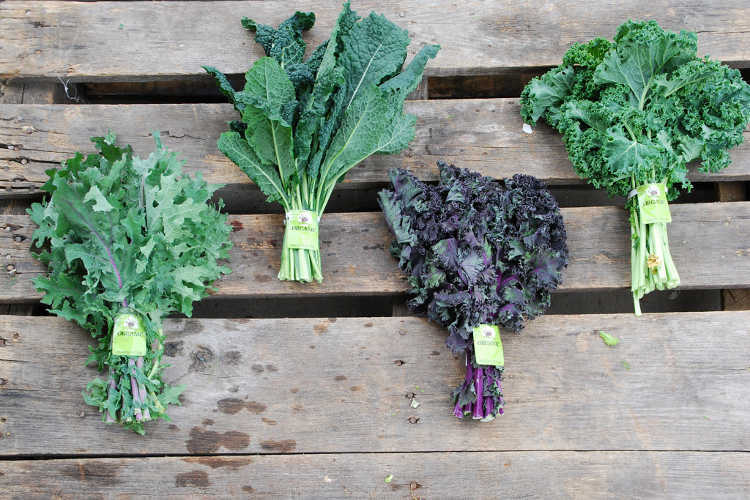 Downy mildew rounds out the list of fungal diseases that can hit kale. This causes yellow to white patches on the top of leaves, and underneath the leaf a grey fungal mass develops. To avoid downy mildew, improve airflow around your plants and try to avoid getting them wet. It develops quickly in humid or moist conditions. Bonide Copper Fungicide will kill it, and neem oil is also effective. Finally, there’s black rot, the only common bacterial infection of kale. All cruciferous crops are susceptible in varying levels to black rot. This causes yellowing on the edge of the leaf which gradually spreads to a V shape. If it gets into the plant’s veins, it can destroy the entire plant. While copper fungicides can help with black rot, what’s truly most effective is prevention. Ensure there’s good airflow around your plants, and try to reduce humid conditions as much as possible. Rotate crops annually and wait at least two years before growing kale or other crucifers in that spot. In the Summer you put the kale in the freezer for 20 minutes to sweeten it. That’s how I learned it. Worked well. Always used the huge leaves no problem. I recently tried kale for the first time and I was impressed. With the help of your article I am really thinking to begin growing on my own and maybe make a business out of it. Thanks!